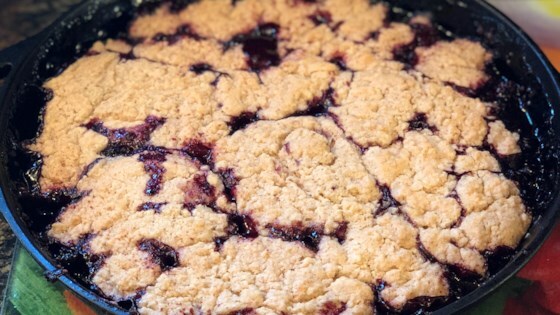 "Throw together this cobbler in minutes using fresh berries from the yard!" In a large bowl, mix the flour, 1/2 cup sugar, baking powder, and salt. Cut in butter until the mixture resembles coarse crumbs. Stir in 1/4 cup boiling water just until mixture is evenly moist. In a separate bowl, dissolve the cornstarch in cold water. Mix in remaining 1 cup sugar, lemon juice, and blackberries. Transfer to a cast iron skillet, and bring to a boil, stirring frequently. Drop dough into the skillet by spoonfuls. Place skillet on the foil lined baking sheet. Bake 25 minutes in the preheated oven, until dough is golden brown. This was good but WAY too sweet. I made it a second time using only 1/2 cup sugar in the fruit mixture and it was PERFECT. Yummy--thank you! LOVED it! I used blueberries and peaches instead and boiled it in a pot and then transfered it to a pyrex dish - b/c i don't have a cast iron skillet. It was perfect.